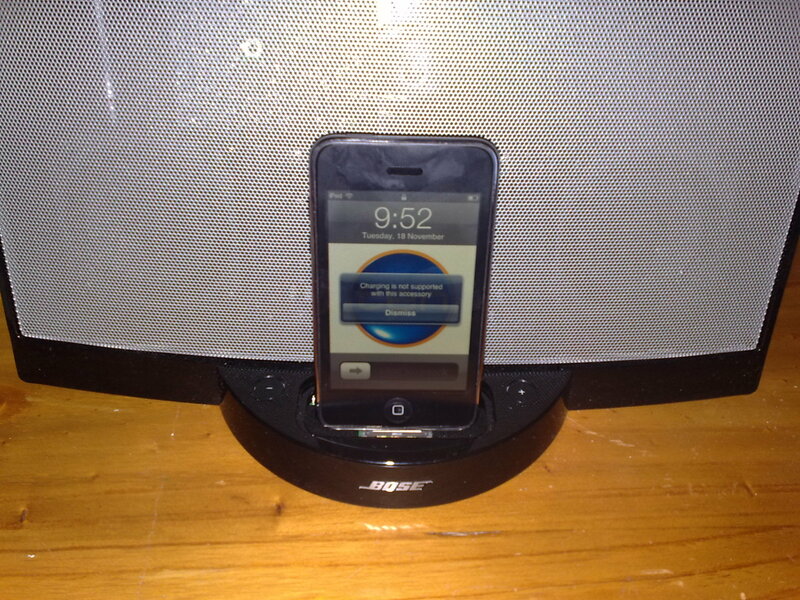 iPod Touch 2G doesn’t Like Bose Sounddock 1G! Warning - cannot charge device! SoundDock, which happily cranks out tunes and charges the iPod Touch 1G. Only been waiting for about three years, ever since Natalie Bassingthwaighte (who was still in Neighbours and just starting with Rogue Traders) raved about how she took hers everywhere. Then, last week had the good fortune (thank you Network Ten!) to get the iPod Touch 2G with the nice silver trim, slightly lighter form factor (maybe that’s an illusion) and best of all, the built-in speaker. Husband immediately pounced on the 2G but after he purchased some skins and covers that were designed for the 1G, was convinced to do an exchange. So imagine my horror tonight when I docked the 2G and got the warning message that the device was incompatible with the Sounddock and won’t charge. Argh! Should we ever have an all night party (haha) looks like we will be using the 1G to pump out the tunes or going back to the iPod video. This of course now explains why the Bose SoundDock was suddenly on sale for $349, which is $100 less than usual. There was small print saying not all iPods may be compatible but my husband is pretty sure he asked and was told the iPod Touch would work. So, music lovers, if you want an iPod Touch 2G and a Bose SoundDock that charges it, make sure to buy SoundDock 2 or apparently the portable version (both in the $449 price range). I’m sorry to hear of your troubles with I’m going to pass along the info! There is a product available at http://www.scosche.com/ called the passPORT home which will allow the iTouch or the iPhone to use the original Bose SoundDock. It cost me $39 but was worth it. Thanks for the tip will have to look it up as am sick of charging the ipod in the car or on the laptop! Yup…that thing is perfect for the older Bose Docks. That comment saved me a few hundred bucks with the switch to a newer iPod Touch from the classic ;). Jobs announce iPad today.. Anyone buying?